Maryland Crabs (Blue Crabs) have been caught commercially in the Chesapeake Bay since the mid-1800s and are integral to the state’s economy. Maryland’s management of daily catch limits is designed to ensure that annual crab harvests stay balanced with shifts in abundance. Each winter, the Maryland Department of Natural Resources conducts a dredge survey and estimates the number of spawning-age females to ensure a growing population. Crabs grow by molting or shedding their shell. Soft-shell crabs are blue crabs that have shed their hard outer shell and whose new shells have not yet hardened. Soft-shell crabs generally are available from May through September. 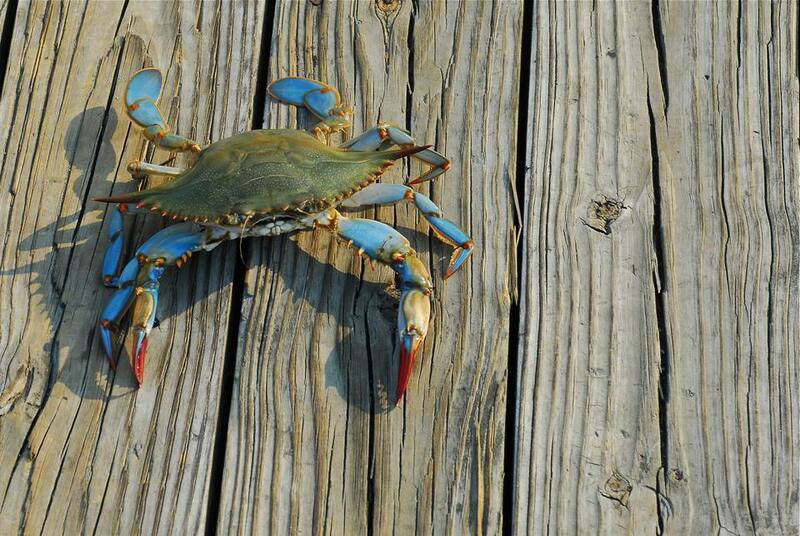 The Blue crab's scientific name is Callinectes Sapidus, meaning "beautiful swimmer that is savory." Although the blue crab is commonly known as “the Maryland crab,” a large portion of them are caught in the Virginia waters of the Chesapeake Bay. Blue crabs are bottom-dwelling predators and feed on a variety of live and dead fish, crabs, clams, snails, eelgrass, sea lettuce, and decayed vegetation. They have a brilliant blue color on their front claws (tips are red on females) with an olive or bluish-green protective, hard shell-like shield that covers the back. Male and female crabs can be distinguished by examining their abdomen on the underside of the crab. The male's abdomen is long and slender, resembling an inverted "T." A female's abdomen changes as it matures; an immature female has a triangular shaped abdomen whereas, a mature female is rounded. Blue crabs are harvested as hard shell crabs, peeler crabs (just prior to molting), and soft shell crabs (immediately after the molt). The legal size for harvesting male crabs is 5 inches or more across; peelers, 3 inches across; and soft crabs, 3 and 1/2 inches across. No size limits are set for mature females. In the State of Maryland, a recreational crabber may crab without a license from docks, piers, bridges, boats, and shorelines using dip nets and any number of hand lines. A property owner may set a maximum of two crab pots on a privately owned pier at their property but must register. There is no charge. A Recreational Crabbing License is required of persons catching crabs for recreational purposes in the waters of the Chesapeake Bay and its tidal tributaries using any of the following gear: crab traps, net rings, seines, or trotlines. In Virginia, a license is not required to crab recreationally as long as you do not use commercial fishing gear and limit your take to one bushel of hard crabs or two dozen peeler crabs per day. Two crab pots per person are allowed without a license. Crab is a favorite Maryland food and is prepared in many ways—steamed or sautéed (soft shells), as crab cakes and crab imperial, or in crab soup and crab dip. The prime season for crabs is during the summer months, May-September. Male crabs are meatier and preferable over females. Crabs are priced by size —usually medium, large, extra large, and jumbo. Larger crabs are more expensive but tend to be tastier. An adult can easily eat 6-12 crabs at one sitting. Crabmeat is not filling, so you will probably want to eat something else with them. Popular side dishes are corn-on-the-cob, crab soup, baked potatoes, and salads. Steamed crabs are usually cooked in Old Bay Seasoning, which is a blend of herbs and spices that are made in Maryland specifically for seasoning crabs. Beer compliments the Old Bay Seasoning and is sold by the pitcher at most crab houses. Crabs are messy to eat. Dress casually, find an outdoor patio and roll up your sleeves and enjoy. Although blue crabs are distributed throughout the U.S. Atlantic and Gulf coasts, there is no place better to enjoy them than along the Chesapeake Bay. Prime destinations in Maryland include Baltimore, Annapolis, and the historic towns along the Maryland Eastern Shore. In Virginia, Chincoteague Island, the Virginia Eastern Shore, and Virginia Beach offer a variety of great crab houses. Since crab is such a beloved mainstay of Chesapeake Bay life, it is celebrated with abandon at fairs, cook-offs, and festivals. St. Mary’s Crab Festival – June. Leonardtown, Maryland. The event includes food, arts and crafts, live country music, and a car show. Tilghman Island Seafood Festival – June. Tilghman Island, Maryland. Highlights include local seafood, live music, crab races, crafts, Queen and Little Miss contests, artisans, and a firemen's parade. Taste of Cambridge and Crab Cook-Off – July. Cambridge, Maryland. The Crab Cook-Off features local chefs preparing a variety of crab dishes. The street festival includes a professional crab-picking competition, live music, kids' activities, and contests. Chesapeake Crab & Beer Festival – August. National Harbor, Maryland. The crab feast includes beer and wine, arts & crafts, live music, and children's activities. National Hard Crab Derby – August/Sept (Labor Day Weekend) Crisfield, Maryland. The three-day event includes crab races and contests, rides, crafts, live entertainment, fireworks, and more. Maryland Seafood Festival – September. Annapolis, Maryland. The annual event features the Capital Crab Soup Cook-off, live music performances, craft booths, and family activities.